I received a sample of the product for review purposes & a gift card as compensation. Oh summer how I missed you! I love the longer days, barbecues, nice weather (and driving conditions), pretty summer dresses…I could go on! There’s so many positives when I think about summer. Though there’s always negatives too like bugs, humidity and sunburns! I have very fair skin and do not tan. In fact, I go right from stark white to angry red and skip that golden tan that I’m just not lucky enough to have. That’s fine I guess and I deal with it, but I’d rather keep my pasty whiteness than have a painful sunburn. Therefore, sunscreen is an absolute must for me when I’m outdoors for any period of time. 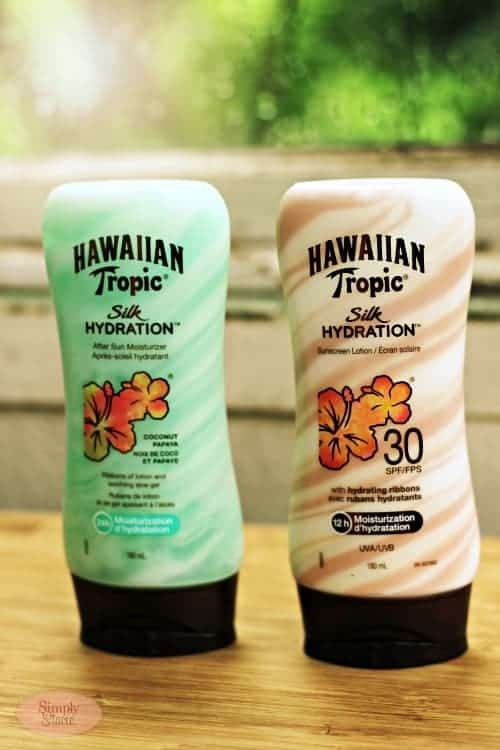 I recently tried two products from Hawaiian Tropic: Silk Hydration SPF 30 Sunscreen Lotion and Silk Hydration After Sun Moisturizer. Silk Hydratio SPF 30 Sunscreen Lotion offers both UVA and UVB sun protection and is waterproof. It’s formulated with hydrating ribbons infused with silk protein and shea butter to provide 12-hour moisture. I noticed the ribbons initially when I squirted some on my hand to apply. I found it’s application lighter than some other sunscreens I’ve used in the past and I also noticed that a little goes a long way. I also appreciate that it’s not greasy. My face is already oily, but the first to burn so I always need to wear sunscreen. I loved how soft my skin felt after it’s application and the classic coconut scent reminds me of summers past. We were out doing some yardwork over the weekend and I’m happy to report no burns! I’ll be wearing the sunscreen on our next trip to the beach if it would stop raining for more than a couple hours! Or better yet, maybe I should just take a vacation! The Silk Hydration After Sun Moisturizer is the perfect product to apply after a day in the sun. It has ribbons as well, but of aloe and mango & shea butter lotion to moisturize and soothe skin. I love using aloe on my skin because of its healing properties. It provides 24 hours of hydration and has a tropical coconut papaya scent. You can find both products at grocery, drug and mass retailers across Canada. The Silk Hydration Sunscreen also comes in SPF 50. It’s SRP is $10.99. The Silk Hydration After Sun Moisturizer has an SRP of $9.99. I have 25 additional samples to give away to 25 Canadian readers! Those 25 readers will then have the opportunity to win a $50 Visa Gift Card by sharing their review of the sunscreen & after sun moisturizer with me. Please fill out this form to apply. The first 25 people will receive a sample from the PR Firm. One sample per person and household. Canadian addresses only. I’ll email the first 25 people who filled out the form in full this evening. Thanks everyone! Update: everyone who is getting a sample has been emailed. Protect your skin! or you shall regrert it someday!